Happy birthday today to my very wonderful mother! She received her gifts from us last weekend: seasons 1 and 2 of Downton Abbey and baked chocolate doughnuts with a buttermilk glaze. Lucky lady, right? Mom’s early birthday celebration was the perfect excuse to break in my new doughnut pan. I considered apple cider doughnuts, blueberry doughnuts, cinnamon doughnuts with maple glaze. But, really, what’s better than chocolate for breakfast? 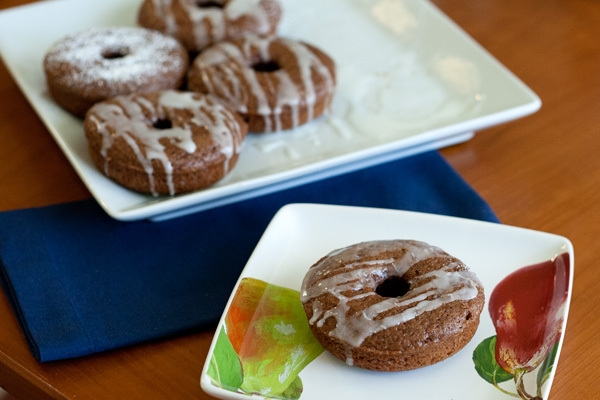 And these chocolate doughnuts couldn’t be more simple to make. They really took just 30 minutes from start to finish. First, sift together flour, cocoa powder, baking powder, and baking soda. Then add sugar, salt, and a pinch of nutmeg. Add bits of cold butter to the flour mixture and mix until crumbly. In a separate bowl, combine buttermilk, yogurt, vanilla, and one egg. Add the dry ingredients to the wet ingredients, and stir until just combined. 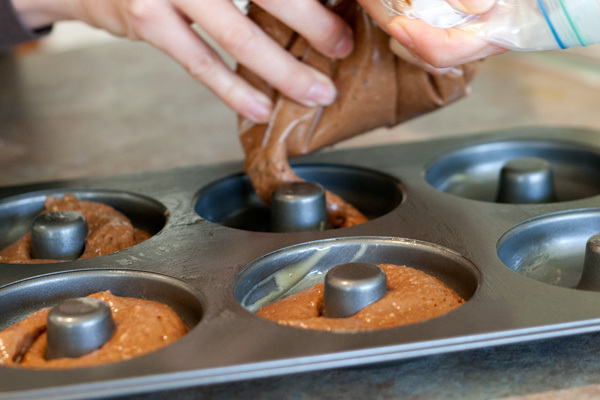 Spoon the batter into a plastic bag, and cut a small hole into the corner (or use a piping bag). Then squeeze the batter into the doughnut pan. Bake at 350°F for about 10 minutes, until the doughnuts spring back when touched. 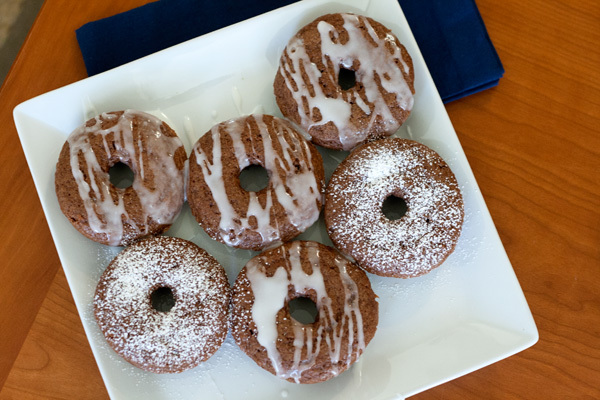 While the doughnuts are baking, whip up a simple glaze of 1 cup powdered sugar and 1 teaspoon buttermilk. Add more buttermilk, if necessary, in small amounts until a smooth paste forms. After the doughnuts have cooled just slightly, drizzle the glaze on top. I also dusted a few in powdered sugar. Easy, right? And delicious. Fluffy, moist, and much more healthy than their fried counterparts. I need to find a reason to bake doughnuts every weekend. 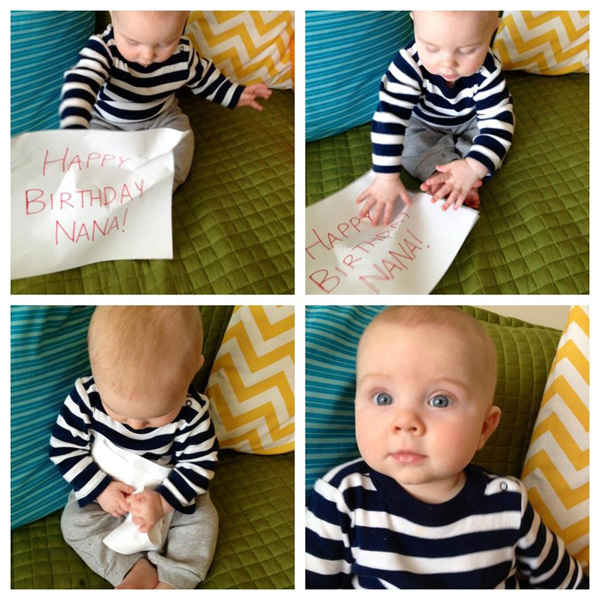 Finally, a message from Sammy to his Nana. 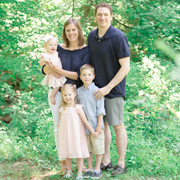 We love you and wish you a very happy birthday, Mom! Lightly grease a doughnut pan, and preheat the oven to 350°F. 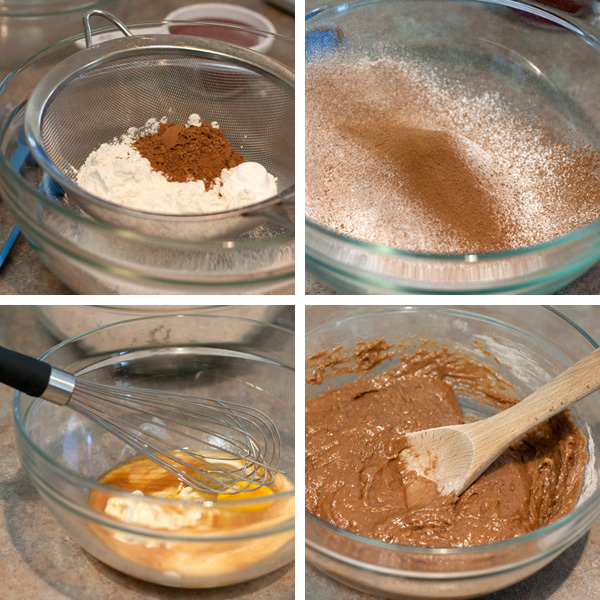 Sift together the flour, cocoa powder, baking powder, and baking soda. Then whisk in the sugar, salt, and nutmeg. Add the butter, and using your fingers or a pastry blender, rub it into the dry ingredients until it becomes crumbly. In a separate bowl, whisk together the buttermilk, yogurt, vanilla, and egg. Add the wet ingredients to the flour mixture, and stir until just combined. Do not overmix, or your doughnuts will be rubbery. Fill each cup of the doughnut pan 1/2 to 3/4 full. You can do this with a spoon, a piping bag, or a plastic bag with a hole cut into the corner. Bake for 6 to 10 minutes (depending on the size of your doughnut pan), until the doughnuts spring back when touched. Let them cool slightly on a wire rack before glazing. For the glaze: Combine 1 cup powdered sugar and 1 teaspoon buttermilk. Add more buttermilk, if necessary, in small amounts until a smooth paste forms. 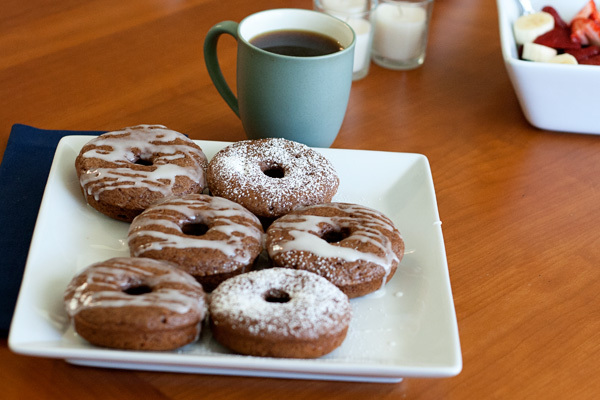 Drizzle onto warm doughnuts and serve. These look incredible. The glaze really helps make them look like “real” doughnuts! aw man these look amazing!